This Weeks Challenge I surprised myself - I actually got it done on Monday!!! It was good to take some time to sit on the porch, enjoy the spring weather and relax doing a zentangle. This has been a very busy year so far and I missed some tangle time. 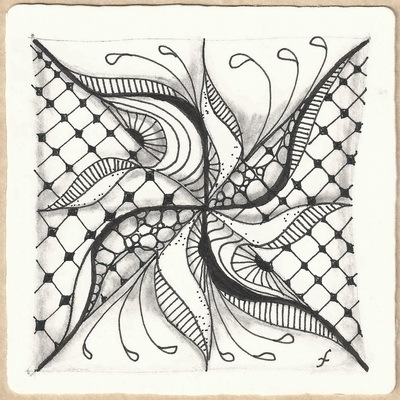 I'm hoping that with this challenge my "fortune" has changed and I'll have more peaceful moments to enjoy Zentangle. Thank you, Laura for a wonderful challenge this week. I love the way you threw the curves at those straight lines! What a pretty tile! Here's to better fortune in the year ahead. I love it! So flowing and beautiful! Ooo! I like the flow-ey feel of this! Good work! Very pretty!! would love to see this on a scarf! You managed it perfect to integrate all triangles to one shape. Wow! I love it . So very "fortune-ate"